Malacca strait shipping business volume accounted for the global 40%-60%, is one of the busiest maritime traffic channels, the Singapore Strait is West of Malacca Strait, and Southeast of China Sea, is an important channel connecting the Pacific and <?xml:namespace prefix = "st1" ns = "urn:schemas-microsoft-com:office:smarttags" />India Ocean. In order to widen the company product marketing network and optimize the products after sale service model, on the basis of Southeast Asia market distribution demand, Zhejiang Hengxin decided to set up a branch in Singapore– Hengxin offshore(Asia) Pet Ltd, successfully registered in Singapore in December 2013, mainly engaged in sales and inspection lifesaving equipment, after nearly three months of operation planning, relevant business of Singapore branch officially launched in March of 2014. 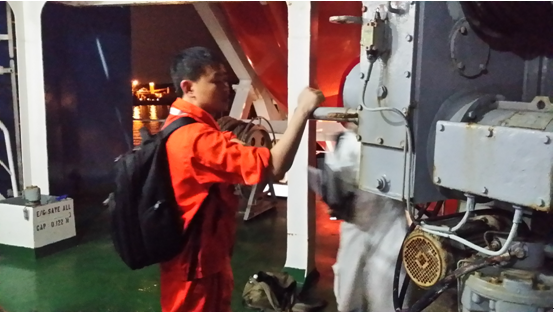 On March 20th, 2014, Hengxin offshore (Asia)Pte Ltd received the first business of boat and davit inspection service from Malaysian tanker, under normal circumstances, need a day time, due to the vessel have to leave early in the morning of next day, and the inspection has to be done in the night and so ,we collected our staff to discuss the best implementation plan, the chairman and his Singapore partners boarded the ship to do inspection of product, after a tense and orderly act with united strength, race against time, until the early of 4 am of the morning, the annual inspection of the successful completed, to ensure that the cargo ship departure on time at 8:00 in the morning. In such emergency situations, this smooth and efficient completion of the repair business is not easy, the Malaysian freighter boss is very touched, and several new orders confirmed. This is the first business of Hengxin offshore (Asia) Pte Ltd, and established a good brand image to in the minds of customers; also establish a good start for the future expansion of related business. We Believe that by adhering to the "sincere communication, standardized operation, efficient service, reputation first" principle of service, truly for the sake of customers, each other mutual trust will be built.